Meanwhile, when experts are claiming that technology is harmful for the present generation and is making everyone addictive and lonely, it is also giving flexibility to people with disability to live life on their own terms. There are various apps in the market that are helping people with disability to modify their surrounding and lift their spirit. 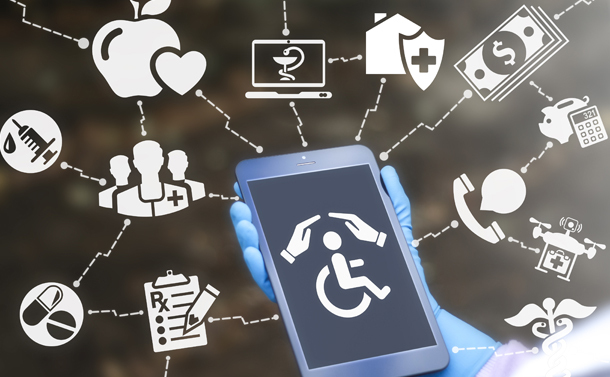 Let’s have a look on six such apps to help people with disability. Designed for blind and visually impaired, it is a mobile camera app that uses camera and voice over features of the smartphone to identify and inform about nearby objects to the users. The app uses camera to take photographs, identify the object via Internet and read it aloud for the user using Voice over. Currently, the app is available on both iOS and Android devices. To use this app, user must double tap the screen for clicking photographs. The app identifies 2-dimensional or 3-dimensional object within seconds, irrespective of the angle. Also, TapTapSee is equipped with several other features. For instance, it can upload images directly from the camera roll, can repeat the details about the last image captured, share posts on social media websites and save images to the camera album of the phone with the attached tag. This app is again for the blind and visually impaired that connects them with volunteers. Here, anyone can register them self as a volunteer for this noble cause and assist blind people via video connection. The app is available for both iPhone and Android devices. This app connects sighted volunteers with visually impaired via a notification. As soon as the request is accepted, a live audio-video connection is established between them. One can also make changes in the settings in the language section based on your mother tongue. If you are not able to answer the request call, then it is automatically forwarded to another volunteer. This app is designed for people with speech, motor and language disorder. Talkit app also supports Cerebral Palsy, Amyotrophic Lateral Sclerosis (ALS), brain damage, stroke, autism and Parkinson’s disease. Recently, it has updated its website and changed its name from talkitt to voiceitt. The app decodes jumbled pronunciation into comprehensible language, letting people interconnect via their own voice. The expertise behind the app is amazing as it identifies the vocal pattern of the user and express their language in a clear manner. Hence, making people independent by letting them communicate easily and clearly. The best part of this program is that it works in every language. Furthermore, this hand-free voice recognition app allows face-to-face communication on real-time basis with friends, family, and strangers. Also, the technology behind this app is designed in such a manner that it can be integrated into smart speakers, smart homes, and Assistive and Augmentative Communications devices. Available only on iOS devices, this app helps children with Down syndrome, Autism Spectrum Disorders, Cerebral Palsy, Angelman’s Syndrome and other speech disabilities. This Augmentative and Alternative Communication (AAC) app enables children to speak using pictures in different situations. The app uses pictures, symbols and high-quality voice fusion to aid non-verbal users generate messages and enhance language skills. The app is accompanied by a powerful keyboard that assists users during text transition. This app is for people suffering from hearing problems but don’t use hearing aid. Available only on iOS devices, HearYouNow app modifies the sound quality for the user based on their need. The app can be used in public places such as meetings, restaurants and parties or if listening to radio or watching TV. Headphones are attached to the device with the app and then the sound is amplified per ear. It has three frequency bands to tune with speech understanding along with the option to optimize background or foreground sounds. Available only on Android devices, the app uses computer vision technology to let user access any app on their smartphone or tablet. All they have to do is simply move their head. This app is for people who cannot use their hands. With this app, they can post on Facebook, Tweet, send messages, make phone calls and download apps that are touch-free. This app focuses on adults and children with developmental disabilities such as learning disabilities, autism as well people with visual disability. Available only on iOS devices, this app permit users to generate visual paths by using their own photos to deal with daily routines and tasks. Its user-friendly interface and simplified process gives users independence flexibility to experience lives on their own terms. Technology has the power to make this world more accessible to the people with disabilities. Though apps cannot change their life completely but a small independent assistance can make a great impact in their lives.